10in x 12in .025 gauge aluminum sign with 1/4in rounded corners and four 1/8in mounting holes. 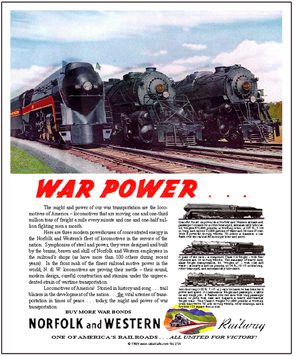 N&W RRs famous trio of War Power locomotives pulling for America in WWII. Class J, A & Y. A beautiful and informative tin sign of an historic railroad ad when America's railroads were on a war footing. Click on above image for zoom.